Lesotho‘s Constitution allows firearms to be used to protect any property in contravention of international law. There shall be a Police Service for Lesotho that shall be responsible for the maintenance of law and order in Lesotho.S. 147(1), 1993 Constitution of Lesotho (as amended). The Constitution further decrees that the National Security Service is responsible for the protection of national securityS. 148(1), 1993 Constitution of Lesotho (as amended).and the Prison Service is responsible for the administration of prisons in Lesotho.S. 149(1), 1993 Constitution of Lesotho (as amended). Under Section 22(1) of the Constitution, any person alleging a violation of the above provision on deprivation of life as well as, among others, the prohibition of torture or other inhuman treatment, may apply to the High Court for redress.S. 22(1), 1993 Constitution of Lesotho (as amended). (b) for the lawful and reasonable chastisement of children. In February 2018, Lesotho's Minister of Police, retired Senior Superintendent ‘Mampho Mokhele, acknowledged that the Lesotho Mounted Police Services frequently use torture to extract confessions from suspects. may, if the stopping, detaining, searching or removal cannot be effected by other means, extend to causing injury to that person.S. 41(e), 1984 Internal Security Act. The Lesotho Correctional Services Act No. 3 of 2016, which entered into force on 1 July 2016, regulates the organisation, administration and discipline within the Lesotho Prison Service. The new law makes it clear that no detainee should be subjected to any form of torture. The 1998 Lesotho Mounted Police Service Act established an Inspector of Police, an independent Police Complaints Authority, and a Directorate of Policing. The Act gives Inspector of Police that has responsibility to monitor the effective and efficient functioning of the police force.S. 21, 1998 Lesotho Mounted Police Service Act.The Directorate of Policing is tasked with overseeing the police. The Police Service Amendment Bill 2003 requires all organs of the state to assist the Police Complaints Authority in its duties. The Authority is not empowered, however, to receive complaints directly from the public. The sanctity of human life, bodily integrity and liberty is a cornerstone of the Bill of Rights in our Constitution, and in enforcing the laws of the land, the police must always exercise restraint in the use of lethal force in effecting arrest. Each case will of course depend on its own particular circumstances. In their use of force whether to kill or incapacitate a fleeing suspect, the police have to exercise restraint and use lethal force as matter of last resort when all other means have failed; for example, when the police pursuing a fleeing suspect are armed with rifles, the police have to warn the suspect that the rifles may be used, and if used, it is necessary perhaps to shoot into the air before actually shooting at the suspect. In this case single burst of firing at the wheels of the bus could have easily punctured them. It seems to me that the shooting was done more to incapacite the driver than to puncture the wheels. 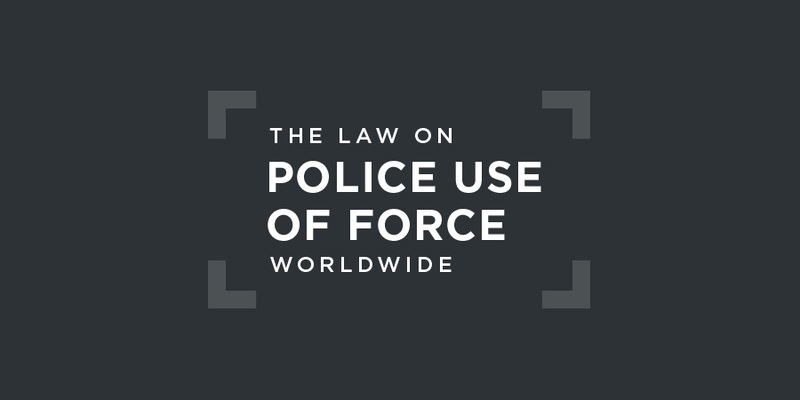 ... the onus to justify the use of force rests upon the defendants to discharge the same on a balance of probabilities. Here we have a case of a suspect who is found seated in the bus, probably unarmed, and whose bus is immediately surrounded by six police officers all armed with heavy rifles. In my view the bus could have been easily and quickly immobilised by shooting at its wheels without injurying the driver, the rifles being of a high calibre. In their random shooting, it seems to me more probable that the shooting was done to "incapacitate the driver" and in my opinion it was an excessive use of force. The police could have shot into the air or at the bus windows to cause plaintiff to surrender. I do not think that shooting the deceased was accidental either because the wheels of a coaster bus are large enough to have been targeted and shot at without injury to the plaintiff. I come to the conclusion that the defendants have failed to discharge the onus that primarily rested on them and find that the use of force in the circumstances of this case was excessive and hence was unlawful. the material facts show that members of CodesaThe name given to a committee formed by junior officers to negotiate their grievances with the senior management of the police force.and the deceased's killers in particular deviated from their normal police duties to such a degree that it cannot be said that in committing the unlawful acts in question they were still exercising the functions to which they were appointed. Put differently, the facts show that the acts of the police officers in question took them out of the course and scope of their employment.